Solve your helix ruler case with the cheapest comparisons in Office Supplies and Hand Tools from our HELIX suspects. To improve your helix ruler search, you should try the category links on the right to drill down, or find more results by using the price options in our search bar at the top. When you have finished your detective work, you will probably have the information you need to buy on your Office Supplies products. 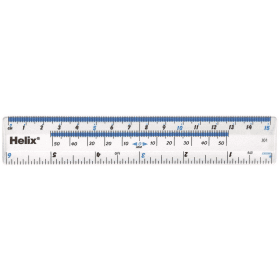 Helix Blue Shatterproof Ruler 45cm Pack of 10 L28040 This pack of 10 rulers from Helix is ideal for classroom or office use. Made from shatterproof blue plastic, they feature metric and imperial measurements.